United States Army Europe (USAREUR), formally United States Army Europe and Seventh Army, is an Army Service Component Command of the United States Army. It is responsible for directing US Army operations throughout the United States European Command Area of Responsibility. During the Cold War, HQ USAREUR supervised ground formations primarily focused upon the Warsaw Pact militaries to the east as part of the North Atlantic Treaty Organisation's (NATO) Central Army Group. Since the Revolutions of 1989, USAREUR has greatly reduced its size, dispatched US forces to Operation Desert Shield and Desert Storm, and increased security cooperation with other NATO land forces. Headquarters, European Theater of Operations, United States Army was a United States Army formation which directed U.S. Army operations in parts of Europe from 1942 to 1945. It commanded Army Ground Forces, United States Army Air Forces, and Army Service Forces operations north of Italy and the Mediterranean coast, in the European Theater of World War II. It was bordered to the south by the North African Theater of Operations, US Army (NATOUSA), which later became the Mediterranean Theater of Operations (MTOUSA). The term "theater of operations" was defined in the US Army field manuals as "the land and sea areas to be invaded or defended, including areas necessary for administrative activities incident to the military operations". In accordance with the experience of World War I, it was usually conceived of as a large land mass over which continuous operations would take place and was divided into two chief areas-the combat zone, or the area of active fighting, and the Communications Zone, or area required for administration of the theater. As the armies advanced, both these zones and the areas into which they were divided would shift forward to new geographic areas of control. Seventh United States Army was the first U.S. Field Army to see combat during the Second World War and was activated at sea when the I Armored Corps under the command of Lt. General George Patton was redesignated on 10 July 1943. The Seventh Army landed on several beaches in southern Sicily and captured the city of Palermo on 22 July and along with the Eighth British Army captured Messina on 16 August. During the fighting, the elements of the Seventh Army killed or captured over 113,000 enemy soldiers. The Headquarters elements of the Seventh Army remained relatively inactive at Palermo, Sicily, and Algiers, North Africa, until January 1944 when Lt. General Alexander Patch was assigned as commander and the Army began planning for the invasion of southern France. The invasion was originally given the code name of Operation ANVIL but was changed to Operation DRAGOON before the landing. In March 1944, Lt. General Alexander Patch was assigned to command the Army which moved to Naples, Italy, the following July. On 15 August 1944, Seventh Army units assaulted the beaches of southern France in the St. Tropez and Saint-Raphaël area. Within one month, the Army employing three American Divisions, five French Divisions, and the First Airborne Task Force had advanced 400 miles and had joined with the Normandy forces. In the process, the Seventh Army had liberated Marseilles, Lyon, Toulon, and all of Southern France. Seventh Army then assaulted the German forces in the Vosges Mountains, broke into the Alsatian Plain, and reached the Rhine River after capturing the city of Strasbourg. During the Battle of the Bulge, the Seventh Army extended its flanks to take over much of the Third Army area which allowed the Third to relieve surrounded U.S. forces at Bastogne. Along with the First French Army, the Seventh went on the offensive in February 1945 and eliminated the enemy pocket in the Colmar area. The Seventh then went into the Saar River valley, crossed the Rhine, captured Nuremberg and Munich, crossed the Brenner Pass, and made contact with the Fifth Army – once again on Italian soil. In less than nine months of continuous fighting, the Seventh had advanced over 1,000 miles and for varying times had commanded 24 American and Allied Divisions, including the 36th, 42nd, 44th, 45th, 63rd,70th, 103rd, and 105th. When the war ended in Europe on 8 May 1945, the ETOUSA headquarters was located in Versailles, France, just outside Paris. As Eisenhower and his staff began to prepare for the occupation of Germany, the ETOUSA headquarters staff moved to Frankfurt, Germany, and co-located with the Supreme Headquarters Allied Expeditionary Forces and the Office of Military Government, United States. ETOUSA was redesignated Headquarters, United States Forces European Theater (HQ USFET) on 1 July 1945, with its headquarters remaining at Frankfurt. At the end of the war, the total U.S. Army strength in Europe was 2.4 million: two Army groups (6th and 12th), five field armies (First, Third, Seventh, Sixth and Ninth), 13 corps headquarters, and 62 combat divisions (43 infantry, 16 armor, and 3 airborne) as well as 11,000 tanks and armored fighting vehicles. Within a year rapid redeployments had brought the occupation forces down to fewer than 290,000 personnel, and many of the larger formations had departed or been inactivated. Seventh Army headquarters remained in control of the western portion of the American zone, and Third Army controlled the eastern portion. In November 1945, the two field army commanders organized district "constabularies" based on cavalry groups, and on 1 May 1946, the zone-wide U.S. Constabulary headquarters was activated at Bamberg. From then until the early 1950s, the structure of the American occupation forces consisted of the 1st Infantry Division, a separate infantry regiment, and the U.S. Constabulary of 10 cavalry regiments. Seventh Army was inactivated in March 1946, in Germany, reactivated for a short time at Atlanta, Georgia, and assigned to the Regular Army with headquarters at Vaihingen, Germany, in November 1950. On 15 March 1947, HQ USFET was formally redesignated Headquarters, European Command (HQ EUCOM) (not to be confused with the present joint command, "USEUCOM", which was formed on 1 August 1952), and between February and June 1948 the headquarters relocated to Campbell Barracks in Heidelberg, where it remained until June 2013. The Army element of the joint European Command headquarters was initially called Headquarters, U.S. Ground and Service Forces, Europe; on 15 November 1947 that designation was changed to Headquarters, United States Army, Europe (USAREUR). 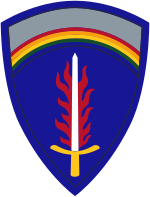 On 24 November 1950 EUCOM activated HHC Seventh Army at Stuttgart to take over the command of the ground and service forces from USAREUR, while other USAREUR functions revert to EUCOM. General Eddy became CG of Seventh Army. HQ USAREUR continued to exist, without troops, to fulfilled certain legal requirements in connection with court-martial and other responsibilities. As noted, on 15 November 1947, U.S. Ground and Service Forces, Europe, was renamed Headquarters, United States Army Europe (HQ USAREUR) to accord with the new Department of the Army nomenclature for such commands. USAREUR was a nonoperational organization that provides the ground and service commander with the command functions required for administrative and logistical support. To it were assigned all ground and service units in the command except those assigned to the Office of Military Government, United States; to the Office of the Commander in Chief of European Command; to U.S. Air Forces Europe; to the U.S. Navy, Germany; and to a few exempted War Department agencies. The offices and personnel of the general and special staff divisions of EUCOM headquarters performed USAREUR's general and special staff duties. The principal function of the commanding general of USAREUR became the establishment and maintenance of high standards of discipline. General Huebner also became Commanding General, USAREUR. On 1 August 1952 the previous "European Command", with headquarters remaining in Heidelberg under the temporary command of General Thomas T. Handy was redesignated Commander-in-Chief, U.S. Army Europe. Also on 1 August 1952, Headquarters, USEUCOM was established in Frankfurt with Gen. Matthew B. Ridgway as commander and Gen. Handy as deputy commander (Gen. Handy wore two hats for a while). The Berlin Blockade began 24 June 1948 when the Soviet Union blocked the Western Allies' railway and road access to the sectors of Berlin under Allied control. Even though Allied forces in the city were outnumbered 50–1, General Lucius D. Clay, in charge of the US Occupation Zone in Germany, gave the order for the Berlin Airlift. Headquartered out of Wiesbaden Army Airfield, the Allies supplied almost 9,000 tons per day of supplies to the beleaguered city until the blockade was lifted on 12 May 1949. From 1948 to 1950, the Cold War began to warm, and the outbreak of hostilities in Korea heightened East-West tensions in Europe. Seventh Army was reactivated at Stuttgart in late November 1950. The two U.S. Army division sized units in the U.S. Occupation Zone of Germany, the First Infantry Division and the U.S. Constabulary, were assigned to the Seventh Army. Within a few weeks other assignments to Seventh Army included the V and VII Corps. Due to President Truman's 10 December 1950 Declaration of a National Emergency as a result of circumstances in the Korean War (the war began in June 1950), four CONUS based U.S. Army divisions were alerted to move to the U.S. Occupation Zone of Germany (these divisions were known as the augmentation force to the U.S. Army in Europe). A main concern was possible Soviet attempts to "take advantage" due to their numerical superiority in Germany during the Korean War. The first augmentation division to arrive overseas in Germany was the 4th Infantry Division in May 1951, followed by the 2nd Armored Division and the 43rd and 28th Infantry Divisions during summer and fall of 1951. A new joint United States European Command (USEUCOM) was established in Frankfurt, Germany on 1 August 1952. On that day, the Army headquarters at Heidelberg, formerly known as EUCOM, became Headquarters, United States Army, Europe. In 1953, the Korean War Armistice was signed, and tensions began to ease in Europe. About 13,500 soldiers manned each of the USAREUR divisions. New equipment fielded at the time included the M48 tank, the M59 armored personnel carrier, and tactical nuclear weapons. On 15 July 1958 USAREUR forces were ordered to assist the Lebanese government. Task Force 201, the Army component of Operation Blue Bat rapidly deployed more than 8,000 Soldiers from Europe to Beirut by air and sea. As the situation quickly stabilized, all U.S. forces redeployed from the country within 4 months. Although the Korean War – open East–West conflict – had ended, political tensions remained high in Europe. Particularly troublesome was the impasse over the Federal Republic of Germany (West Germany, the former British, French and U.S. zones of occupation) and the German Democratic Republic (East Germany, the former Soviet zone of occupation). East Germany [the DDR] was considered by many countries over the years to be nothing more than the Soviet Zone of Occupation; this changed in 1973 with the UN recognition of both Germanies. Berlin posed an additional problem; it was surrounded by East Germany, but Great Britain, France, the United States, and the Soviet Union all occupied sectors in the city. In the early years, travel between the sectors was unrestricted. At the time Soviet premier Nikita Khrushchev announced in June 1961 that the Soviet Union was planning to conclude a peace treaty with the East German government, 3,000 East German refugees flowed daily into Berlin. Suddenly on the night of 12 August 1961, the Soviets closed the border crossing points and began to construct the Berlin Wall, isolating the three western sectors of the city both from East Germany and the Soviet sector, or East Berlin. In response, the United States deployed an additional armored cavalry regiment to Europe, along with additional support units. USAREUR strength reached a post-World War II high of 277,342 in June 1962 as the crisis deepened. That 1946–1991 Cold War maximum USAREUR troop record gradually reduced over time. The command dispatched a reinforced infantry battle group to Berlin to strengthen the existing garrison. The nuclear armed USAREUR did not go to DEFCON 3 during 22 Oct to 20 November 1962 Cuban Crisis due to political reasons. All other US Forces worldwide were at DEFCON 3 per JFK's 22 October speech and direction to the Pentagon; SAC went to DEFCON 2. The crisis cooled in Berlin from 1962 to 1963, and augmenting forces returned to the United States. Equipment modernization programs during this period included the M113 armored personnel carrier, the M14 rifle, the M60 machine gun, the OV-1 fixed wing observation aircraft, the UH-1B Huey helicopter, the M151 MUTT truck, and the M60 Patton tank. In late 1963 Operation BIG LIFT tested the use of prepositioned equipment through redeployment of the 2nd Armored Division to Europe via a single airlift. In the 1970s, USAREUR continued to improve its firepower when it received the new M16A1 rifle, the TOW anti-tank weapon, the OH-58 Kiowa observation helicopter, and the AH-1G Cobra helicopter. During the 1970s, force protection concerns grew as Palestinian groups brazenly conducted terror operations in Europe, such as the kidnapping of Israeli athletes during the 1972 Munich Olympics, and the Red Army Faction and the Red Brigades targeted U.S. facilities and personnel with bombings, kidnapping and assassinations. In May 1972 bombs exploded at V Corps headquarters in Frankfurt, killing an Army lieutenant colonel, and in Heidelberg at Campbell Barracks, killing three Soldiers. U.S. installations were attacked sporadically throughout the remainder of the decade, including a failed 1977 attack on a U.S. Army post in Giessen. On 15 September 1982, an assassination attempt was made on USAREUR commander Gen. Frederick J. Kroesen and his wife as they were driving through Heidelberg—the automobile trunk lid deflected the RPG-7 anti-tank projectile. In 1985 Army Specialist Edward Pimental was lured out of a Wiesbaden nightclub and killed for his ID card which was then used to enter Rhein-Main Air Base the next day to plant a bomb that killed two. And in 1986 a bombing at a Berlin disco frequented by service members killed two Soldiers. With increased combat and support components in place, the command undertook a wide-ranging modernization in the decade of the 1980s. More than 400 new systems were introduced, including individual weapons, field rations, the M1A1 Abrams tank, the M2 and M3 Bradley series of infantry and cavalry fighting vehicles, the MLRS M270 multiple launch rocket system, the MIM-104 Patriot air defense system, the UH-60 Black Hawk helicopter and the AH-64A Apache helicopter. In January 1967, in accordance with Headquarters Department of the Army Msg NR DA796059 dated 9 January 1967, the USAREUR and Seventh Army staffs were merged to become Headquarters and Headquarters Company, United States Army Europe and Seventh Army (HHC USAREUR 7A). The dramatic events of the late 1980s – the opening of the Berlin Wall, German reunification, and the collapse of the Soviet Union – combined to change USAREUR again. Intermediate nuclear weapons of the 56th Field Artillery Command were withdrawn, chemical weapons were moved out of Europe, and units began to depart the European continent while others were inactivated. Then Iraq invaded Kuwait in August 1990. The first deployments from USAREUR to Saudi Arabia in August 1990 included the 45th Medical Company an element of the 421st Medical Battalion (AA) and advance elements of 12th Aviation Brigade, which by September had deployed two Apache attack helicopter battalions, a Kiowa scout helicopter company, a Black Hawk utility helicopter company, a Chinook platoon, and associated support and maintenance units. These were quickly followed by intelligence specialists, chemical warfare experts, logistical personnel, many individual replacements, and finally almost the entire VII Corps. The command eventually deployed more than 75,000 personnel plus 1,200 tanks, 1,700 armored combat vehicles, more than 650 pieces of artillery, and more than 325 aircraft. When the war ended, many USAREUR soldiers remained to complete the logistical cleanup; others were deployed to northern Iraq or Turkey as part of Operation Provide Comfort to aid refugees. Upon their return to Europe, many also found that their units were in the process of either relocating to the Continental United States or inactivating. In 1992 alone, about 70,000 soldiers redeployed to CONUS with about 90,000 family members. The command shrank from 213,000 soldiers in 1990 to 122,000 in 1992. VII Corps was inactivated. From 858 installations in 1990, USAREUR went down to only 415 in 1993 with more scheduled to close in the years ahead. After the Gulf War and the subsequent drawdowns, USAREUR faced a wholly different challenge in Europe. The command was engaged in humanitarian support operations, to include disaster relief and rescue and recovery, peacekeeping and non-combatant evacuations. Between 1990 and 1993 the command supported 42 deployments, which involved a total of 95,579 personnel. Conflict in the Balkans quickly became one of the United States Department of Defense's primary areas of focus, and peace enforcement in Bosnia was a harbinger of future military operations. From 1990 to 1995 USAREUR conducted mostly humanitarian operations in the area. In October 1992, USAREUR sent the 212th Mobile Army Surgical Hospital and personnel from the 7th Medical Command to Zagreb, Croatia to provide medical support for United Nations Protection Force (UNPROFOR) casualties. Throughout 1993–1995, USAREUR's 5th Quartermaster Company, in conjunction with U.S. Air Forces in Europe, delivered humanitarian aid to the region. In June 1993, the command formed Task Force Able Sentry in the Former Yugoslav Republic of Macedonia with the headquarters at Camp Able Sentry near the capital Skopje. These forces, along with personnel from 26 other countries, were originally part of the UNPROFOR which in 1995 became the U.N. Preventative Deployment force (UNPREDEP) deterring the spread of armed conflict. Upon expiration of the initial UN mandate in February 1999, USAREUR renamed the U.S. Army organization Task Force Sabre, with the task to protect U.S. facilities and equipment. They were relieved in June 1999 by the U.S. national support element to KFOR-Task Force Falcon (Rear). U.S. Soldiers left Camp Able Sentry in 2002, but it remained as a contractor operated logistics base until Aug. 2004 when all U.S. personnel departed and NATO assumed control of the camp. In Bosnia-Herzegovina, after the Dayton Peace Accords were reached in Nov. 1995, USAREUR's 1st Armored Division began deploying there in December, with the first C-130 landing in Tuzla, Bosnia, 2 Dec, and the first trains departing Germany 8 Dec.. One major barrier to the deployment of the 1st Armored Division was the bridge over the Sava River, which was destroyed during the four-year civil war. Construction of the longest assault float bridge in military history, 620 meters long, ribbon float (pontoon) bridge between Croatia and Bosnia and Herzegovina began on 22 Dec.. Despite melting snow that flooded the river and later, freezing temperatures, the bridge was completed on 31 Dec and the first M1A1 Abrams tank crossed the bridge at 10 a.m. The division, along with many reserve component support troops, formed Task Force Eagle as part of the NATO-led Implementation Force (IFOR) (also known as Operation Joint Endeavor) with the mission to implement and monitor the military aspects of the agreement, enforce the cease-fire, supervise the marking of boundaries and the zone of separation between the former warring factions, and enforce the withdrawal of the combatants to their barracks and the movement of heavy weapons to storage sites. It was the first time a NATO sponsored force had deployed operationally outside the NATO boundaries. IFOR was succeeded in Dec. 1996 by a smaller, NATO-led Stabilization Force (SFOR) (Operation Joint Guard) whose mission was to deter renewed hostilities. On 20 June 1998 the mission was renamed Operation Joint Forge, and USAREUR continued to serve as the ASCC providing oversight for the mission. On 24 November 2004, Task Force Eagle officially disestablished and closed its base in Tuzla, with European Union forces assuming responsibility for the Bosnia mission. In early 1999, in response to growing ethnic tensions in Kosovo and military and paramilitary forces in daily conflict resulting in the more than 1,500 Kosovar Albanian deaths and 400,000 refugees, USAREUR formed Task Force Falcon, with the 1st Infantry Division as the core element. On 9 June 1999, after an inconclusive air campaign, Task Force Falcon deployed forces in the largest combined air-rail-sea-road movement since Operation Desert Storm, entering Kosovo on 12 June 1999, as part of Operation Joint Guardian, a NATO-led peacekeeping force with a UN mandate to separate warring factions, oversee the withdrawal of Serb forces and interdict the flow of arms to insurgents. On 17 February 2008, the Kosovo Assembly declared Kosovo independent. Currently, the U.S. Army, with approx. 800 Soldiers, has the lead for Multinational Battle Group East (MNBG-E) in the eastern region, headquartered near Uroševac at Camp Bondsteel as part of KFOR. Contributing nations include Greece, Lithuania, Poland, Romania, and Ukraine. The majority of U.S. Soldiers come from U.S. Army National Guard units, with a different state taking over the lead for each rotation of approximately nine months. The 11 September 2001 attacks did not directly affect the Seventh Army. However, the campaign in Iraq in 2003 did. The headquarters of V Corps was deployed to Iraq, as did 173rd Airborne Brigade, and after the campaign, 1st Armored Division followed for occupation duties. With parts of 1st Infantry Division also deployed in Iraq, and others on peacekeeping duties in the Balkans, Seventh Army was virtually stripped of combat formations. The return of 173rd Brigade, V Corps and 1st Armored Division in early 2004 was followed by the deployment of the rest of 1st Infantry Division for occupation duties. V Corps began a rotational deployment in 2009 in support of Operation Iraqi Freedom. The U.S. Army's reorganization plans from 2005 called for the formation's major subordinate units – 1st Armored Division and 1st Infantry Division – to be relocated to the continental United States – Fort Bliss, Texas, and Fort Riley, Kansas, respectively. The 2nd Stryker Cavalry Regiment, converted to a Stryker Brigade, and the 12th Aviation Brigade, replaced them. Seventh Army, having been merged with US Army Europe since 1967, remained merged, as was confirmed with the release of unit designations for the modular force in mid 1996. HQ USAREUR and V Corps were slated to merge and the process started until the decision was made to retain a Corps Headquarters within USAREUR, and V Corps was once again separated from HQ USAREUR. Since that time it was decided that V Corps would deactivate after a final deployment to Afghanistan which is ongoing. In September 2005, it was expected that the finalised force in Europe would consist of USAREUR HQ, V Corps, aviation and combat service support, and two maneuver brigades: the 2nd Cavalry Regiment in Vilseck, Germany, the 173rd Airborne Brigade, which will eventually expand to three airborne battalions, in Italy. Joint Task Force East provided from forces rotating from continental United States though bases in Bulgaria and Romania, was initially intended to be provided by a rotating US-based brigade. Two bases at Constanța, Romania were developed, apparently with the main facility at Mihail Kogălniceanu Airfield. Initially however, Joint Task Force East was to have been provided by a rotational 2nd Cavalry Regiment Stryker squadron. The Task Force was originally planned to be called the Eastern Europe Task Force. However, since the stresses of the Iraq and Afghan deployments, the army provision of Joint Task Force East has been replaced by a Marine force known as the Black Sea Rotational Force. From 2008 to 2012–13, the two to three brigades listed above were augmented by the 170th Infantry Brigade and the 172nd Infantry Brigade, 'reflagged' former V Corps/1st Armored Division formations. Thus from 2008 to 2013, the force will consist of two heavy brigades combat teams, the 2nd Stryker Cavalry Regiment, and the 173rd Airborne Brigade Combat Team. On 25 October 2009, in a ceremony at the Parade Field on Daenner Kaserne, the 7th US Army Reserve Command, United States Army Reserve, was inactivated and redesignated the 7th Civil Support Command. In September 2015 the 7th CSC became the 7th Mission Support Command. On 26 January 2012, Chief of Staff of the United States Army General Raymond Odierno announced that two Army heavy infantry brigades would be withdrawn from Europe and inactivated. As the 170th Brigade was one of only two such heavy infantry brigades in Europe at the time, it was believed that it was one of the units slated to be inactivated in the wake of large cuts in the U.S. defense budget The 170th Infantry Brigade at Baumholder was deactivated on 9 October 2012. In 2013, further reductions of U.S. forces in Europe were announced, that would reduce U.S. Army Europe to 30,000 soldiers in two brigade combat teams. These reductions include unit deactivations and facilities closures at Warner Barracks, Bamberg and Schweinfurt. Military police units were reduced: 202nd MP Group and the 1002nd MP Battalion were disbanded on 24 June 2013. In February 2013, it was announced that V Corps would be inactivated in June 2013. In a ceremony on 12 June 2013, V Corps was awarded the Army Superior Unit Award and Meritorious Unit Citation and formally inactivated. In April 2013, the last of U.S. Army's main battle tanks left Europe due to the departure of the U.S. Army's last two Germany-based heavy brigades: the 170th Infantry out of Baumholder and the 172nd Infantry Brigade at Grafenwöhr. ^ "The United States Army Organization". US Army. ^ "USAREUR Units & Kasernes, 1945 - 1989". Usarmygermany.com. Retrieved 2017-05-21. ^ "Army REgulation 10–87" (PDF). fas.org. Retrieved 19 March 2018. ^ "The Official Home Page of the 7th Mission Support Command". www.eur.army.mil. Retrieved 2017-09-06. ^ Beardsley, Steven; Svan, Jennifer H. (26 January 2012). "DOD plan indicates 172nd and 170th infantry brigades to be eliminated". Stars and Stripes. ^ "Thousands of soldiers to leave Europe". Army Times. 1 March 2013. Retrieved 5 March 2013. ^ "V Corps inactivates after nearly a century of service to U.S. Army". Eur.army.mil. Retrieved 12 June 2013. ^ Verlagsgruppe Rhein Main GmbH & Co. KG. "V. Korps der US-Armee zieht für ein Jahr nach Afghanistan und wird dann aufgelöst – Wiesbadener Kurier". ^ Stars and Stripes: "US Army's last tanks depart from Germany" By John Vandiver 4 April 2013 |"There is no [U.S.] tank on German soil. It's a historic moment." ^ "7th Army Training Command". US Army Europe. Retrieved 2 December 2018. ^ "US Army NATO Brigade uncases colors in Sembach". ^ "UNITED STATES ARMY NATO". ^ "7th Civil Support Command". ^ "Home Page 409th Contracting Support Brigade".